Our Bono Baby is on the mend. It has been an awful weekend for our dear little boy. 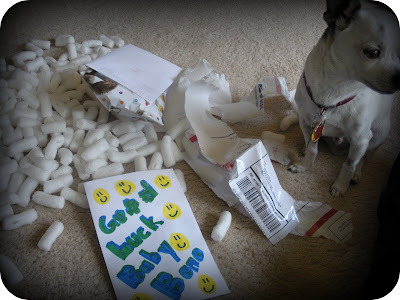 He did perk up a lot when he received his care package from his cousins, Nicole and Tyler. Thank you for all of your thoughts and prayers and wishes. Bono Baby now only has about 12 teeth in his mouth but he is going to be so much healthier. He wishes he could give you all a kiss but his mouth is too sore right now. Maybe in a week or two (and his breath won't stink). I'm so happy to hear he is feeling better. Happy Anniversary! Love you all. What a cute little guy. So glad he's feeling better.